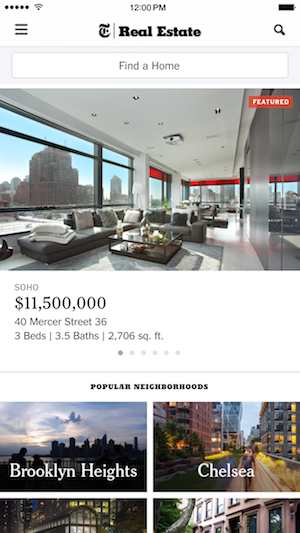 The New York Times has released version 2.0 of its NY Times Real Estate app — one that the company says represents its first “major redesign” since it the mobile web version was launched back in 2007. More specifically, while the app previously included news articles from the Times’ real estate section, those articles have moved now front-and-center. When you first open it, the app feels more like a news reader than a real estate search app. It was previously “a weekend product,” Shadbolt said, but the redesign could entice readers to check it more regularly. Shadbolt declined to offer any specifics about the app’s downloads or usage — according to App Annie, it reached its highest rank in the U.S. App Store (23 in the lifestyle category, 348 overall) back in 2010. The redesign also comes at a time of broader questions about The Times’ app strategy — a little more than a month ago, The Times itself broke the news that it would be eliminating 100 newsroom jobs and shutting down the recently launched NYT Opinion app. The articles are a part of that, and like the app itself, they’re completely free. Other features include filterable search functionality, of course, plus a new mortgage calculator, school information, email and social sharing tools, and “continuously updated sales activity.” The Times says the app includes “the best” properties from around the world, but it sounds its data is richest in New York City.